After finishing Toxic, I was eager to find out more about Franny and just why she appeared to betray Alfie, so the second I had an opportunity to read Fatal, I took it, as I got to see elements of Toxic from another point of view - while setting up another action packed story in its own right. 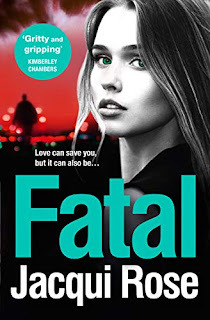 In fact its only after finishing Fatal, that I've just glanced at some of the other blurbs of books by Jacqui Rose and realised that all the books and characters are all inter-related, which if that carries on being the case may mean I am now a complete fan of the author, as I am already curious to see what happens to some of the main players next. I found I liked the characters a lot more this time, possibly as I already was following the connections between them a bit more, and although they are gangsters they are people too, and they really did feel a lot more human this time. Alice Rose, its 16, and due to the way she has been brought up, has a very strong belief in God, and can quote the bible - normally that is something that would have me running for the hills but as the book progressed and she grew into the new life that was being thrust upon her, she really grows, and I have to admire her guts. The pace is relentless, its frenetic and there is always something going on, the perspective being changed, and although there is a large amount of characters, I was able to keep up reasonably well with the various threads. There is something just utterly addictive about this book, and I couldn't stop turning the pages, and my adrenaline was still pumping from the action after I turned the last pages.